This article reported the case of a woman from West Bengal who presented with generalised weakness, weight loss, intermittent diffuse pain abdomen, anorexia, nausea, off and on diarrhoea for eight months. She also noticed darkening of her complexion for six months. Since last 4 months, she had intermittent headache of varying duration, frequency and intensity with tingling and numbness of all four limbs. Her past medical history was unremarkable except for a chronic anxiety disorder for which she was treated by homeopathy medicine. A neurological examination showed preserved higher mental function, bilateral papilledema with intact other cranial nerves. There was mild motor weakness in both lower limbs, both proximal and distal accompanied by hypotonia without any motor weakness in upper limbs. There was distal sensory deficit in the form of glove and stocking hypoesthesia with reduced deep reflexes in all 4 limbs and bilateral flexor planter response. Gastrointestinal examination revealed non-tender enlarged liver with 16 cm span, mild splenomegaly and mild ascites. Investigations showed mild microcytic hypochromic anaemia (Hb- 9.2 g/dl, MCV-78 fl, MCH-26 pg, MCHC- 31.3 g/dl), low serum iron (27.5 mcg/dl), low TIBC (84.4 mcg/ dl), high serum ferritin (808.6 ng/ml), raised transaminases (AST- 40 IU/L, ALT- 98 IU/L), low serum total protein (4.6 g/dl), low serum albumin (1.9g/dl), globulin (2.7 g/dl) and raised alkaline phosphatase (789 IU/L). Nerve conduction velocity of all four limbs was suggestive of sensorimotor neuropathy. Unexplained, apparently unrelated multi-system involvement including chronic diarrhoea, presence of liver disease, peripheral neuropathy, idiopathic intracranial hypertension (pseudotumor cerebri ) and characteristic skin lesions suggested chronic arsenicosis. Arsenic level in hair was found to be 1.06 μg/g (N= 0.02-0.2 μg/g) and arsenic level in nail was 1.24 μg/g (N= 0.02-0.5 μg/g) with normal arsenic content (0.03 mg/l) of the drinking water of the locality. Further questioning revealed that the patient was taking arsenicum album for her anxiety depressive disorder for last one year. The drug was discontinued. Six months later the patient had fully recovered. The authors concluded that an apparently harmless homeopathy medicine may cause multisystem involvement. 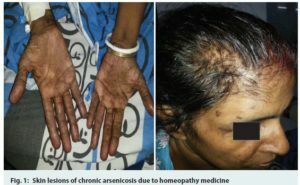 Case 1 presented with melanosis and keratosis following short-term use of Arsenic Bromide 1-X followed by long-term use of other arsenic-containing homeopathic preparations. Case 2 developed melanotic arsenical skin lesions after taking Arsenicum Sulfuratum Flavum-1-X (Arsenic S.F. 1-X) in an effort to treat his white skin patches. Case 3 consumed Arsenic Bromide 1-X for 6 days in an effort to treat his diabetes and developed an acute gastrointestinal illness followed by leukopenia, thrombocytopenia, and diffuse dermal melanosis with patchy desquamation. Within approximately 2 weeks, he developed a toxic polyneuropathy resulting in quadriparesis. Arsenic concentrations in all three patients were significantly elevated in integument tissue samples. In all three cases, arsenic concentrations in drinking water were normal but arsenic concentrations in samples of the homeopathic medications were elevated. CONCLUSION: Arsenic used therapeutically in homeopathic medicines can cause clinical toxicity if the medications are improperly used. The authors of the new paper fail to mention the potency of the homeopathic arsenic preparation taken by the patient. As far as I know, in Europe, only high potencies of arsenic are prescribed and dispensed; these remedies contain no or very little arsenic and can thus be considered harmless. In India, however, the 1-X potency seems to be popular, according to the second paper cited above. It describes a dilution of 1: 10 only. It is clear that taking such a remedy would quickly lead to severe toxicity. This begs the questions: Is it legal to prescribe and dispense such remedies in India or anywhere else? And, in case it is legal, why? I’m not sure how a 1-X potency conforms to the principle of like cures like. But then, trying to make any sense of homeopathy is like fretting over Han Solo making the Kessel run in less than 12 parsecs. Principle of like cures principle means that, since X causes simptoms A, B, C etc., it can be used to treat (according to homeopaths), either of these symptoms or all of them. Where as 1X, is just a weak potency (again, according to homeopaths). I understand the principle of like cures like – i.e. that if a high dose of something causes symptoms then a vanishingly low dose can be used to treat the same symptoms – although I do not accept the truth of it. But a 1x dilution isn’t simply a low potency dilution in homeopathic terms, it is actually a real dose with conventional pharmacological effects. It appears to follow that whether a 1x dilution can produce or relieve specific symptoms depending on the intent of the person administering it? It often surprises me how little people know of history, even recent history. Arsenic was in prevalent use as a tonic before the modern age of paranoia. And it has (had) medicinal uses. Indeed, I recall purchasing a bottle of a famous Hungarian Arsenic-laden tonic way back in my own ancient history, out of curiosity. Sadly, I believe it is now banned by the meddling EU, long before the ‘in secret’ ban on Boron/Borax, after that element was discovered to be essential for bone and joint health – which is why you can’t easily buy borax any more. (What do you call alternative medicine that works and can’t be patented? – BANNED medicine!). And of course it can cause arsenosis, the Smurf-like syndrome (I recently met a gentleman tinted blue from inappropriate use of silver – unrelated to homeopathy). There’s a great deal more to be said about Arsenic, medically and culturally, but I’m not going to go on at length. The key phrase in the paper is ” if the medications are improperly used”. The major author appears to have a special interest in environmental arsenic poisoning; I have no idea what his attitude is to homeopathy or AyurVeda (but those subjects do have their coffin-chasers willing to take a pop at alternatives if the whim catches them, and who often seem blind to the problems of ‘conventional’ medicine). I don’t have access to the paper, so I cannot tell if these remedies were prescribed (in which case, possibly by some very poor homeopaths), or else bought OTC by reputation and folklore (“in an effort to treat”). Homeopaths – since Hahnemann – are not great supporters folklore, preferring an evidenced approach (though the nature of ‘acceptable’ evidence has changed from producing actual cures and positive results to a more constrained approach with its own methodological bias). Incorrect use of homeopathic remedies is the bane of some lives, practitioners, patients and self-prescribers. Much the same could be said of other disciplines. renders them incapable of clear thought. A repertory gives over 120 remedies which might be matched to a patient with diabetes. Ars-br is a mid-ranking possibility. Each remedy would have to be well understood to make a good match (to the patient), and even remedies outside this list should be useful, if indicated. It is not, as some pseudo-skeptics seem to believe, a hit-and-miss process (but I suppose we shall get the tiresome recourse to ridicule anyway from people who know no better). The conditions mentioned would need an experienced homeopath to prescribe; remedies would not be chosen on a per-disease basis but matched to the totality of the way the individual patient reacts to the environment. Prescribing allopathically can certainly give rise to problems. Btw, unless the picture is distorted, the figure 1 looks superficially like a case Marfans. old chap is a little patronising, isn’t it? I know of arsenic treatments in medical history. BUT THIS IS ABOUT HOMEOPATHIC ARSENIC 1X; it kills people, which ever way you prescribe it. It is a distorted photograph, not Marfan’s syndrome. In the latter, the arachnodactyly primarily manifests in the phalanges rather than the metacarpals. Also the pattern of the underlying cloth provides a clue, as well as the fact that the distortion is affecting the images of the two hands differently since they are at different angles. to the line along which the picture has been stretched. I’m not clear from your post whether you are suggesting that there are still acceptable medical uses for arsenic. If so I am not aware of them. Historically many treatments have been used (and indeed have been effective) which are now regarded as far too toxic to consider, generally once better alternatives have been developed. For instance mercury was extensively used as an antiseptic as well as a treatment for syphilis (“an evening with Venus followed by a lifetime with Mercury” as the saying goes). Many poisonous draughts have been sold as tonics over the years and probably still are. My favourite story as a clinical oncologist is that of Radithor, which contained radium. The case of Eben Byers (a wealthy American socialite and industrialist) is well-documented. He drank it daily for years before dying of bone marrow failure. 33 years later he was exhumed and his skeleton was still highly radioactive (not very surprising since radium is readily taken up in the skeleton in place of calcium and in its naturally-occurring form has a half-life of 1,600 years). Indeed, I remember seeing an autoradiograph of his skeleton printed in (I think) Scientific American in the 1990’s but I can’t find the reference. I was struck by the similarity to a modern technetium-99 isotope bone scan (extensively used in staging cancer, though perhaps not for much longer in the UK if Brexit makes it impossible for us to obtain the technetium). The thought that there may still be hundreds or thousands of bottles of this stuff floating around in attics and junk shops is quite scary, particularly as radium in this form (Ra-226 and Ra-228) is an emitter of highly energetic gamma rays which require several centimetres of lead for adequate shielding. If you come across any, don’t handle it, and whatever you do don’t take the top off as radium decays to radon gas, which is also highly radioactive. Arsenic salts are very colourful, and used to be used for colouring food. This is probably the reason why it is still considered back luck in Scotland to eat green sweets. In India such things do happen. That is why there is need to go to a proper Homeopathic Doctor. My friend’s husband who is a heart patient is taking homeopathic medicines since 3 years and I asked my friend why is he taking it for so long, just leave it. One year homeopathic medicine is more than enough to last entire life span but she said that the Homeopathic doctor has advised to continue the treatment (may be he is getting to earn from his bunny). The patient suffered a heart attack and has a pace maker inserted but their faith in homeopathy doesn’t go. At the dawn of its development homeopathy was much simpler than what it is today. The illnesses that the patients came up with were not as complicated and less chronic. The homeopaths back then were skilled in handling these infectious diseases whereas the other medical systems failed to show similar efficiency. as far as I can see, there is no good evidence for the claims you just made. 200 years ago, most treatments were ineffective. the difference was that, contrary to conventional treatments, homeopathics did not do much harm.